The desert tortoise (Gopherus agassizii) is a widespread desert species of the southwestern United States. Since its federal listing as a threatened species in large parts of its range, it has become a primary consideration in almost every activity that occurs in the Mojave Desert. Population declines are due primarily to disease, collection, raven predation, and loss of habitat as a result of urbanization. Other contributing factors include the spread of invasive species and human activities such as off-road driving, military maneuvers, and livestock grazing. These activities not only crush the tortoises and their eggs, they also destroy native plants that provide food, water, shade, and shelter. Urbanization causes habitat fragmentation, a serious problem as each tortoise may require access to up to 3.9 km 2 of habitat. 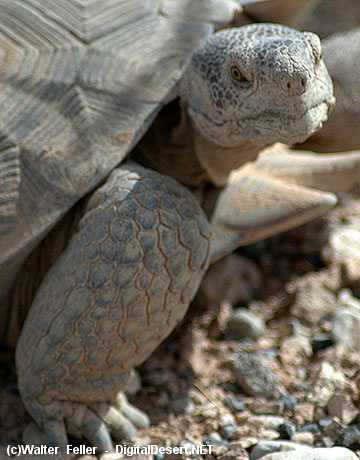 Some desert tortoises also suffer from an upper respiratory disease, and ravens prey on hatchlings. Raven populations have increased in the Mojave as people have brought new food sources, such as landfills and garbage dumps, to the desert. The BLM administers about 75 percent of the remaining high-quality desert tortoise habitat in the Mojave Desert. The agency is taking a lead role in tortoise habitat management, and has eliminated livestock grazing on almost a half-million hectares in Nevada alone. The BLM has designated these lands as Areas of Critical Environmental Concern, according them special protections.To both accommodate urban growth and protect the tortoise, a team of federal, state, county, city, and private partners has developed a special "habitat conservation plan" to help streamline compliance with federal and state endangered species laws. This has allowed continued development around Las Vegas and other areas in Clark County, Nevada, while raising millions of dollars in mitigation fees to support broad conservation and research efforts. One result is the Desert Tortoise Conservation Center, located on public lands south of Las Vegas, which supports critical research on the species. Under BLM leadership, an interagency habitat conservation plan is also being prepared for a 3.8 million hectare region within the western Mojave. The plan addresses the conservation needs of over 100 sensitive species in the face of rapid development of suburban Los Angeles. The desert bighorn sheep will also benefit from desert tortoise habitat recovery efforts. Like the tortoise, its population has suffered as a result of habitat fragmentation. It also could not compete with domestic livestock and wild burros for food and water. Its numbers declined precipitously in the Mojave Desert until about 20 years ago, when steps were taken to reverse this trend. BLM and the State of Nevada have now reintroduced the desert bighorn sheep to most of its former range in Nevada, and managers are cautiously optimistic about its future.